Nathan Rosenberg and The Doghouse NYC. Studio and Musician Bio. Music, Production, Recording. Founded in 1995 by New York producer and jazz pianist Nathan Rosenberg, The Doghouse NYC is a unique studio that provides services ranging from recording and mastering to composition and production. The Doghouse NYC is popular with jazz artists, singer-songwriters, established artists and emerging bands alike, all of whom have come to depend not only upon musical skill but production sensibility and intuition. The Doghouse NYC is now housed in a stunning and innovative space in Brooklyn: a cozy, world-class facility tucked conveniently in beautiful Park Slope. 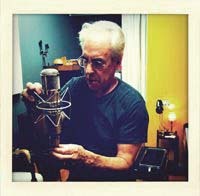 Nathan has recorded jazz greats such as Kenny Washington and John Hicks and has contributed to major label records such as Poe's Hello for which he earned a gold record. He also collaborated on 5.1 surround releases for Santana's Shaman (Arista) and the classic Janis Joplin record “Cheap Thrills” (Sony). In addition, Nathan's playing and compositions have appeared on countless albums, HBO specials, and computer games scored for companies such as Atari. As a pianist, Nathan is featured in Leslie Gourse's biography of Wynton Marsallis, Skain's Domain. He is known for his fresh approach to the repertoire of jazz standards. Embracing a modern feel with shades of the blues, his sense of harmonies brings chord changes away from standard patterns and adds harmonic twists and unexpected bops that liven up traditional tunes with fresh energy and rhythmic punch. A vocal descendant of Joe Williams with shadings of Nat Cole and Chet Baker, Nathan's bluesy, smoky voice brings new life to the standard ballads and jump tunes that, as a jazz musician, have been his stock and trade. As an author, Nathan has contributed to publications such as Recording Magazine and programmed keyboards and sounds for Broadway shows such as Annie, Dream, and The King and I. A graduate of Sarah Lawrence College, Nathan has studied with greats such as Hal Galper, Fred Hersch, Ernie Hatfield, Tom Young, and Katherine Rowe. He holds professional associations with BMI and the AFM. As the father of two children, he almost never sleeps. Located in Park Slope, Brooklyn, The Doghouse NYC was founded in 1995 by Nathan Rosenberg. MACY'S SWING: An all-star cast swings hard in this high-enery demo for a Macy's holiday spot.